My students instinctively if inchoately know that sloppiness in the liturgy is connected to sloppiness in doctrine, and they want neither, because both are poison. In taking up the latest papal interview, I am violating two of my own rules: 1) not to pay attention to any more papal interviews, which are too often shambolic and vexatious, 2) and not to pay attention to any Jesuits discussing liturgy (with apologies to my Jesuit friends Richard Soo, Joseph Koczera, and Cyril Pinchak). But “sovereign is he who decides the exception,” so let us proceed with the rule-breaking. I always try to understand what’s behind the people who are too young to have lived the pre-conciliar liturgy but who want it. Sometimes I’ve found myself in front of people who are too strict, who have a rigid attitude. And I wonder: How come such a rigidity? Dig, dig, this rigidity always hides something: insecurity, sometimes even more … Rigidity is defensive. True love is not rigid. This is a common stereotype I have heard for nearly twenty years from other Catholic bishops, priests, and especially so-called theologians. While my mother taught me that slander and name-calling were best ignored, this splenetic remark from the current incumbent of the Roman bishopric cannot be ignored, and not merely because it unfairly represents the position of many attached to the extraordinary form of the Latin liturgy, but more especially because it hides poisonous attitudes toward the liturgy as a whole. These attitudes have been widespread for forty years or so, and have deeply damaged not only the Latin Church’s liturgy but have infected and harmed the Church more widely. Following Thomistic method, let us make more explicit some of the presuppositions of the papal statement before responding to them. It would seem that what is latent in the papal comments is a commonly held view that flexibility and creativity, when applied to the liturgy, are both desirable and commendable. In advocating for such things, the pope clearly has support from Christ in his battle with inflexible Pharisees (to whom the pope has unfavorably compared some Catholics in the past), who uncreatively and uncharitably bound people with laws that forsook a focus on the larger good. We must not be rigid and insecure like the Pharisees. It would seem, moreover, that the pope has in mind his own predecessor, Peter himself, in his insecurity about whether certain foods were unclean and not to be eaten. Peter’s rigidity in this matter is rebuked and corrected by the Lord Himself: “What God has cleansed, you must not call common” (Acts 10:15). We must not be rigid and insecure like porkophobic Peter. It would seem, finally, that the pope is worried about a lack of love as being the real problem hiding underneath this ostensible liturgical “rigidity” and “insecurity.” If perfect love casts out fear (1 John 4:18), then what do these young people have to fear about the liturgy? We must not be fearfully rigid as they—supposedly—are. Sed contra: Rigidity in defense of the liturgy is no vice; laxity in observing the rubrics is no virtue; and sloppiness in celebrating divine mysteries is no way to show love to the Lord or to His people. I respond that “rigidity” here must be clearly understood: it is no vice insofar as it seeks not to harm people or to prevent them from communion with the Lord, or to tie them up in knots about the length of their surplices or skirts, or the rigors of their fasting. “Rigidity” here is simply a request that the liturgy be celebrated according to the rubrics. Let us further understand clearly what rubrics are: they are the means by which the Church shows love. Rubrics are a daughter-virtue of the cardinal virtue of love. In this regard, rubrics are like manners, also a daughter-virtue of love. I observe manners—holding doors for people, say, or not sneezing over the mashed potatoes before passing them to you at the Thanksgiving table—because in doing so I am manifesting my love of neighbor. 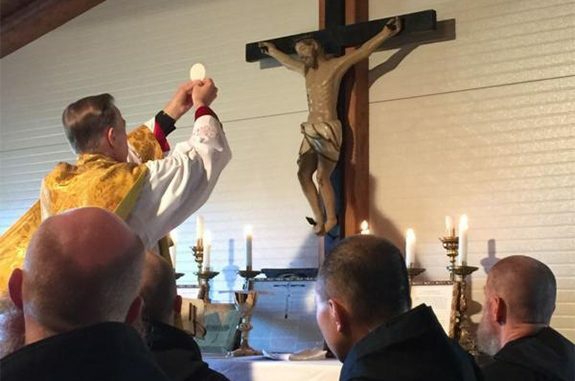 Similarly, the priest observes the rubrics of the liturgy because he, too, is manifesting love for the people, who come not to be entertained by Fr. Fun’s witless golfing jokes, or boorish boosterism in favor of the local sports team, whose decal has been duct-taped onto the chasuble for that Sunday, or whose mascot is processed in on a hoverboard right behind the Gospel book. The people come to show their love to God, and to thank God for his love. Love, to avoid descending into mawkish sentimentality or other destructive tendencies, requires the form, structure, and rubrics of the liturgy to preserve it, an insight I first learned by studying Adirenne Rich’s wonderful poem “At a Bach Concert” where she writes that “form is the ultimate gift that love can offer.” If the Eucharist is the ultimate gift that love can offer, why should we not hem it about with form to protect it from what Rich goes on to call the “else-betrayed, too-human heart”? Young people today bear many burdens with little grace offered them by the Church’s ordinary liturgical and doctrinal culture, which has, in far too many places, been in an advanced state of degradation and decadence for fifty years. I would wager that I have more direct, first-hand experience of young people today than the Roman bishop does, and I do see in them a legitimate and understandable fear that the Church has deprived them of many of her liturgical and doctrinal treasures after a half-century of experimentation, “flexibility,” and “creativity.” In a chaotic world, they want to be grounded in the Lord and not buffeted about by every whim and fancy that strikes foolish and selfish hierarchs, clergy, and theologians. I see in them, moreover, a legitimate concern which the pope unjustly slanders as “rigidity.” They are not inclining towards “rigidity” because they are Pharisees in the making, eager to deprive people of communion with God while self-righteously parading their own piety. They want a solid grounding in the Lord, and they instinctively if inchoately know—as I hear them stammer out their concerns in my classes week in and week out—that sloppiness in the liturgy is connected to sloppiness in doctrine, and they want neither, because both are poison. One reason why we Christians argue so much about which hymn to sing, which liturgy to follow, which way to worship is that the commandments teach us to believe that bad liturgy eventually leads to bad ethics. You begin by singing some sappy, sentimental hymn, then you pray some pointless prayer, and the next thing you know you have murdered your best friend.